This house was designed by architect William Bates in the late 1800s, along with many other homes in Lawrence Park, Bronxville’s turn-of-the-century artists’ colony. Two artists live here today and it’s evident from the listing photos that they consider their home an extension of their art. Check the Sotheby’s listing for all the photos and information. You can take a video tour of the property and the trains that run on it here. 5. Historic Higgins House in L.A.
Curbed reports that after “a half century of neglect,” Perry and Peggy Hirsch restored the Queen Anne Hiram Higgins Mansion, which was declared a Los Angeles Historic-Cultural Monument in 1988. If it looks familiar, that could be because it’s appeared in many movies, including the Addams Family in 1991. That front door is something else. Wow. The house is on the market for the first time in three decades. Check the listing for photos and details. This waterfront home on Bainbridge Island has a ton of potential…and a ton of wallpaper, too. This could be a real charmer for someone willing to put the work into updating it (read: willing to strip wallpaper from vaulted ceilings). Thanks to all the readers who submitted these! Do you have a favorite? The kitchen of the house in Bronxville – the only words that come to mind are Mary Englebreit on Safari. Wow. Beautiful house on the outside. The interior is crazy, but I’ll bet they had fun with it. The Higgins Mansion in LA is amazing. I think I could just live happily ever after in the entry hall. That wood work is beautiful. Whoa. That first house. That was such a fun 90-second adventure flipping thru those pictures!! This house is def not my style but very interesting! I have an eccentric aunt/uncle who lived in a similar crazy, fun house when I was growing up and it was such a treat to visit them! She is an interior designer and he is and architect. She is a huge collector of MacKenzie-Childs and that kitchen SCREAMS Mackenzie-Childs! Wow, you put a lot of work into this one, Julia! 1. Love the outside, confused by the inside. I think they may have some trouble selling this, at its current price point. The taxes alone could bankrupt a person! 2. Love this place! Definitely my favorite of this bunch, and the best value for dollar, IMO. 3. 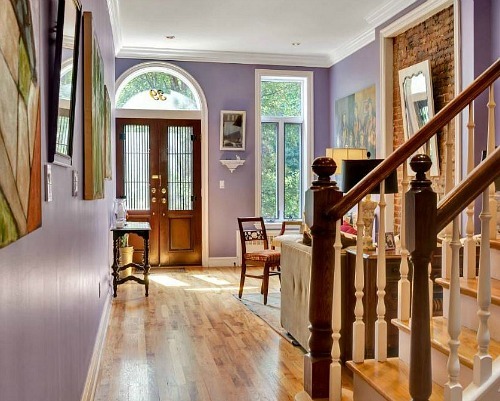 This townhouse is charming. Love the artwork and exposed brick! 4. Interesting, but very, very costly; especially for Oregon. 5. Light and whimsical outside, dark and creepy inside. I do appreciate the quality of the craftsmanship, however. 6. Pretty, but a bit spare and colonial for my liking. 7. I love everything about this place! Everything besides the copious amounts of wallpaper and pink carpeting, that is! Seriously though, this could be so gorgeous! 8. Cool penthouse, but a bit dark and masculine, no? That Vermont property is gorgeous! The sunroom is especially nice. That was my favorite of the bunch. How beautiful are the grounds??!!!! I’m a true believer in doing whatever you want to in your own home, but I’m sorry, they have ruined that beautiful first house. You know there’s gorgeous wood hiding under all that paint. It’s beautifully done art but…. I would rather see it restored to it’s original beauty. All very interesting to look at, and all either have been or could be absolutely gorgeous. But they all look a little off in one way or another, and are expensive enough that you’d like them to be perfect. Don’t know which I’d choose, even if money were no object. Maybe the one on Bainbridge Island, even though the architecture is my least favorite. How can you say no to your own beach? What an eclectic real estate sampler! Fun to look at such different and interesting homes. One of my fantasies, when I win the lottery, is to have a summer home on Bainbridge Island. Here’s the home, which I could update with my millions; alas, I’ve yet to win the lottery. I love the wallpaper pattern on the chair in the Bainbridge Island house, but not on the walls. The property of the VT house is fabulous, not too keen on the actual house. The Higgins mansion needs love and I need to be wearing the wardrobe from Age of Innocence as I sweep through the rooms. The NYC penthouse screams hedge fund money to me and bachelor pad and the kitchen seems out of place, but those views? Man oh man. Star Pudding Farm in Vermont for me! First thing is all that gorgeous land – 247 acres! Woods, gardens, fields, pond, rock boulders, and mountain views – wonderful. And those rock walls and stone lookout tower! The house fits my vibe, too, with sunroom and library, rock fireplaces, and beamed ceilings. Looks like it might need some maintenance, but what the heck. Plenty of room in those extra cottages for friends and family to visit. It would make a great family compound. Loved Star Pudding Farm and I think Curbed featured the Bainbridge Island home a while back, making light of all the matching floral decor. Still–a private beach? Might have to pull a bank job ;-). I’d settle for the boat house of that Bainbridge Island place! I’m a Scot who grew up in government housing, lived in Greece then moved back to a pretty area of central Scotland where we now own our own home, but because of all the American TV I watched as a child, American houses are my dream homes. Not the star mansions or the huge ones, just the sweet, family ones you find on tree-lined streets; I love the attention to design, the painted clapboard and trim, the painted prettiness and the simple functionality. I know you love your blog, and now make a living from it, but I just wanted to say, as someone who’s been visiting since 2009, that I’m still grateful for the pure visual joy it brings and for the dreams; some day I will have a painted clapboard house with french doors, doors that lead out to something other than child-worn scrubland and the ugly fences that divide us from three sets of neighbours and a public path. But for now, in these turbulent, troubled times, having a place to visit that’s just for dreams and friendly, like-minded obsessives is a gift. You’ve built a beautiful, welcoming blog home here that’s grown over the years, just like a well loved home that’s evolved as the family grows. Thank you! What part of Chicago? My dad grew up in Oak Park where there are some incredible homes. Dave grew up in South Holland and his dad took the train in to the city each day to work at NBC. It was a newer neighborhood at the time, when they were building a lot of little ranch houses. Julia – like others have said, you put a lot of work in on this all for our enjoyment. Thanks for that. Star Pudding Farm: I LOVE the name alone. But then the property doesn’t disappoint either. Magical, really. Something about it reminds me of The Clearing – an Art School and Retreat on the upper part of Door County Wisconsin. Don’t know why exactly but some of the structures there mimic the open spaces in this home. You might have fun looking at their website – even though it’s not a House. Invitation’s still open for you to do a story on the treasure trove of amazing houses in Webster Groves. Number 1 is quirky indeed; too, too quirky for me. Number 7 looks lovely from the outside but its a wallpaper nightmare on the inside and the furniture doesn’t seem to match the style of home. Love the rest of them though.